Using the post_gallery filter, like you suggested, enables deleting the subclass for the 'Gallery' widget. Of course, another plugin is free to override the behavior here by either adding a new shortcode callback for gallery, or filtering post_gallery later. 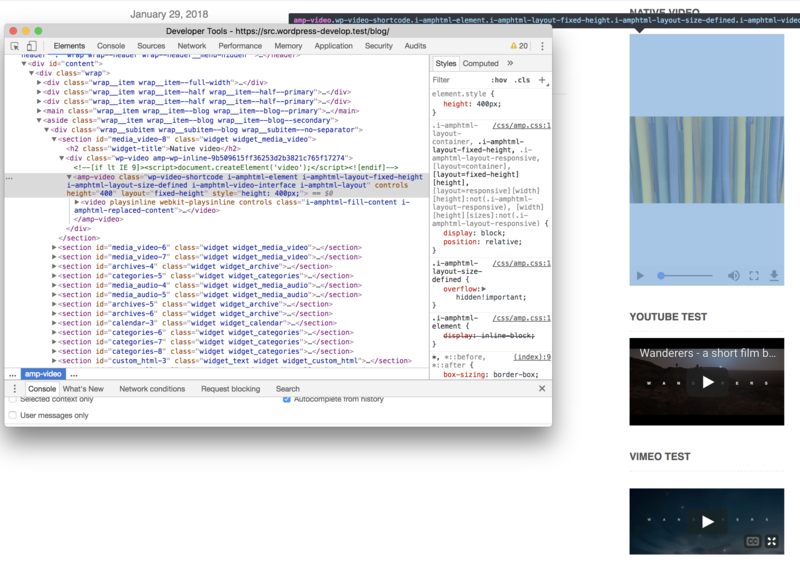 Issue #864: Address an issue in 'Video' widgets for YouTube and Vimeo. So override the value of wp_video_shortcode(), which renders these. Produce 'youtube' or 'vimeo' shortcodes. And this plugin's handlers will create <amp-youtube> and <amp-vimeo>. Another plugin is also free to override those shortcodes. Issue #864: Only override video widget output if is_amp_endpoint(). Similarly to how the other widget overrides work. Also, adjust tests for this. Issue #864: Align equals signs in response to Travis error. Issue #864: Simply return the initial value, instead of ''. This will allow another plugin to override this. Inspired by the Jetpack plugin's return of the initial value. Issue #864: Remove the 'Gallery' widget subclass, in favor of a filter. Using this removes the need to subclass that widget. As Weston mentioned, Jetpack filters 'post_gallery'. This extends an abstract class, so this method has to be implemented. This isn't ideal, but editing this embed handler enables deleting the entire 'Gallery' widget subclass. add_action( 'wp_head', array( __CLASS__, 'add_amp_custom_style_placeholder' ), 8 ); // Because wp_print_styles() normally happens at 8. I'm thinking that video_override actually would be better put into either a new video embed class, or else to add the method to the Vimeo and YouTube. This would ensure that Vimeo and YouTube videos used with the video shortcode will work in the old paired mode templates as well. It shouldn't be limited to theme support. This commit moves the video_override callback into the YouTube and Vimeo embed classes, like you suggested. * @param array $attr The shortcode attributes. * @return string $markup The markup to output. In other words, add this method to both the AMP_Vimeo_Embed_Handler and AMP_YouTube_Embed_Handler classes, but in each one only account for the Vimeo or YouTube URLs respectively. Thanks, @westonruter. This commit from above applies your suggestion. fixed-height definitely seems wrong here. It should likely either be fixed, if you want a fixed size one that isn't responsive, or responsive, but responsive needs a specified width and height. Are there cases were we wouldn't know the aspect ratio? I guess external videos from some random URL? In those cases, I agree with @westonruter, I'd assume a 16/9 ratio and use responsive. The way the <video> tag in HTML works luckily means it won't be stretched, and fill up with blank space. Issue #864: Move video override logic into embed handlers. These are now in the embed classes. Also, create test classes for them. Thanks for pointing out the issue and possible solutions for the <amp-video> aspect ratio. I'll work on that either later today or tomorrow, if that's alright. Are there cases were we wouldn't know the aspect ratio? I guess external videos from some random URL? In those cases, I agree with @westonruter, I'd assume a 16/9 ratio and use responsive. The way the tag in HTML works luckily means it won't be stretched, and fill up with blank space. Yes, the external URLs won't known aspect ratios, unless we try to fetch them to read the dimensions (which we're actually doing for images now). Otherwise, videos uploaded into the media library do get their dimensions parsed. The wp_get_attachment_metadata() function will return the width and height of the video if it was able to be parsed. Once the dimensions are restored, then we'd have the desired aspect ratios. But the videos will at that point be too large for the container. So then I think the main thing left will be to make sure the video gets a max-width:100% style. This could be added as a style attribute by the Video sanitizer since the Style sanitizer could then later move the inline style to be in the amp-custom style element. For this to work, amp_get_content_sanitizers() should be modified to move AMP_Style_Sanitizer be run immediately before AMP_Tag_And_Attribute_Sanitizer. I think it is not ideal as it is right now to be run as the first sanitizer. Issue #864: Handle a 'fixed-height' issue with 'Video' widgets. When they use 'Media Library' videos, they output <amp-video>. The AMP_Video_Sanitizer added a 'layout' value of 'fixed-height'. The height of 400px didn't look good, as the aspect ratio was wrong. Instead, make video widgets that use <amp-video> use layout=responsive. Detect this by checking that neight 'width' or 'height' are present. inject_video_max_width_style() removes these attributes for the widget. Otherwise, retain the previous logic. But your idea looks to be cleaner. Revert "Issue #864: Handle a 'fixed-height' issue with 'Video' widgets." Issue #864: Video widget fixes, including width and height. in order to override the callback that strips the height and width. Also, add a style of 'width:100%' to the <amp-video>. This ensures that the widget doesn't overflow the container. 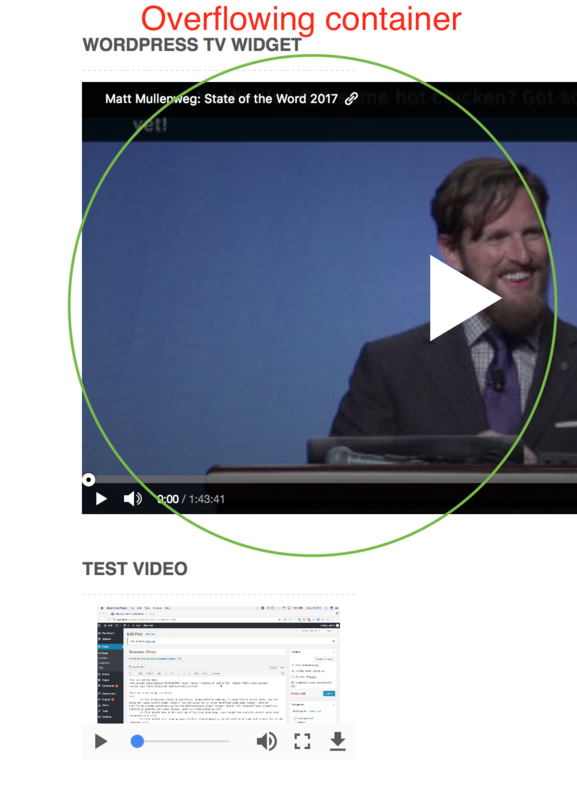 Prevent the stripping of <video> width and height attributes. Also, move the addition of the 'style' attribute. The commits above apply your suggestions for the 'Video' and 'Text' widgets, and they now appear as expected. This is similar to this fix for the <amp-video>. 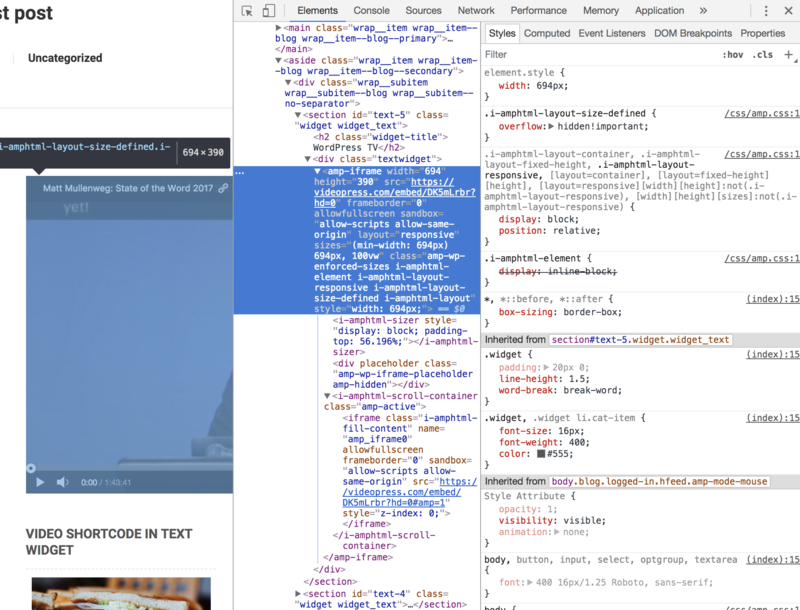 But this will mean that every <amp-iframe> will have style="max-width:100%". Is that alright? But this will mean that every will have style="max-width:100%". Is that alright? Yes, that's OK. Maybe it would be better to work it into some default CSS that gets output, but this should work great for now. This all makes sense with the exception of max-width: 100%. In AMP land, this should never be required as soon as the layout attribute is set to responsive. I'm curious – why is that not an option here, or is there something I'm missing? @westonruter that sure sounds like a bug on our part (I suspect it is related to our implementation of the sizes attribute, it did some weird stuff when I last checked). @aghassemi, can you take a look? The selected source size affects the intrinsic size of the image (the image’s display size if no CSS styling is applied). If the srcset attribute is absent, or contains no values with a width (w) descriptor, then the sizes attribute has no effect. This means that srcset affects only the size if no CSS overrides it. The layout attribute to me seems comparable to an "explicit" setting of the layout, similar to CSS, so I'm fairly determined that the right behavior should be to prioritize the layout property, and ignore the sizes attribute for styling. To further clarify, the sizes attribute primary use-case is to tell the user agent what the displayed size will be at a certain browser width. The primary function is not to enforce said display. @cvializ and @aghassemi, what are your thoughts? Does this make sense? @bpaduch has run into this before when doing a demo and was equally confused by our sizes behavior. I strongly suggest changing it. Agree, Dima and I were chatting about this last week, we have decided to remove AMP custom logic from sizes/srcset completely and use native. Issue to track is ampproject/amphtml#11575 which is planned for end of February. Great thanks for clarifying. @kienstra and @westonruter, as workaround I propose to temporarily get rid of the sizes attribute here (this should fix the behavior). Some background on this decision comes in ampproject/amphtml#1280 (comment) and #101. @westonruter sorry for the late response. The way sizes has been used in the past in the plugin (described in the comment you pointed out) is not spec compliant, and will break with the changes the AMP team is planning for end of Feb.
Sizes, in the future is only telling the browser what the rendered sizes will be, not enforce it. Which means that in terms of actual styling, sizes will be doing absolutely nothing going forward. Sizes is useful if you know exactly how an image will render – e.g. if you know that at 600px viewport it will render full width, and at 1200px you set up a grid in CSS, so it will render next to two others, you can tell the browser that through the sizes attribute. The problem is that in WordPress, you only know this precisely if you know the exact CSS used to drive the styling. Thus, I'd say it's safer to remove for now, and bring back once we can parse the entire CSS and make an accurate prediction of the actual rendered size. This is definitely a job for CSS.